Salix humilis. © Marilee Lovit.New England Wildflower Society.gobotany.newenglandwild.org (Accessed 8/2014). 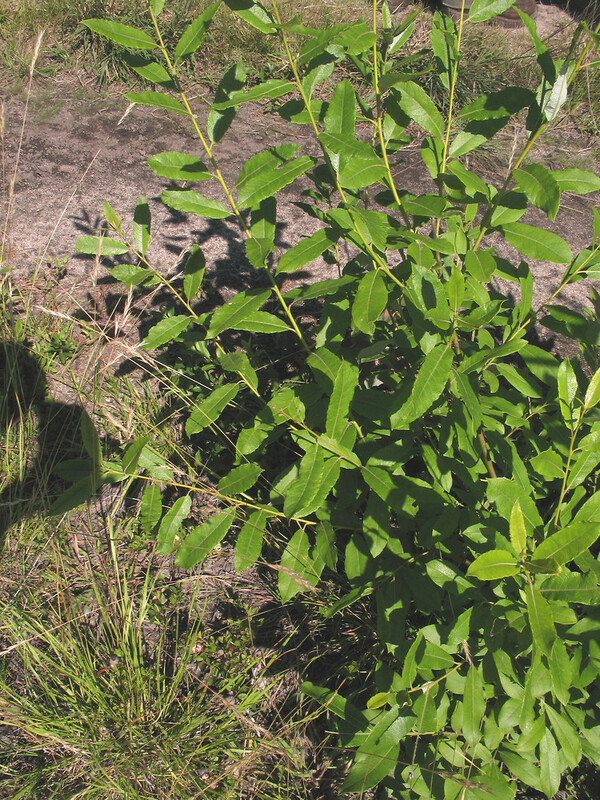 Salix humilis is a shrub to 3 m tall, colonial; twigs yellowish to brown, hairy, stipules narrow. Leaves alternate, narrow, widest above middle, to 10 cm long, 2 cm wide, tip pointed, margin entire to wavy, slightly turned under, dark green above, often finely hairy, waxy-pale below, gray-hairy (when young), wrinkled, leaf stalk to 0.7 cm. Flowers dioecious in catkins, on wand-like branches, 2-4 cm, scales blackish, hairy, blooms before leaf-out, Mar.-April. Fruit dry capsules to 1 cm long, gray-hairy. Habitat: Open areas, soil pH 5.9-7 (USDA, NRCS 2010). Tolerant of flooding, drought, salt, soil compaction. Very intolerant of shade (Hightshoe 1988).